A milk thermometer from is used by baristas for measuring the temperature while frothing milk. The optimal temperature for frothed milk is around 65°C. At higher temperatures the proteins start to break down, and the taste is not the best for coffee. 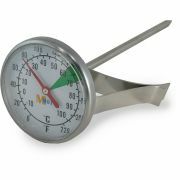 Thermometers for baristas come with a clip that can be attached to the pitcher, and they have a marking for the optimal temperature range.